As construction continues on Hartsfield-Jackson’s multibillion-dollar capital improvement program, ATLNext Industry Day returned for the third year to educate and inspire contractors, particularly minorities and women, about business opportunities at the world’s busiest airport. ATLNext officially kicked off in fall 2016, and since then, the Airport has made enormous progress on massive canopies rising alongside the Domestic Terminal as well as renovations to the Transportation Mall and hold rooms. Future projects under ATLNext include additional gates, new cargo and parking facilities, a sixth runway and even a makeover of the Domestic Terminal atrium. 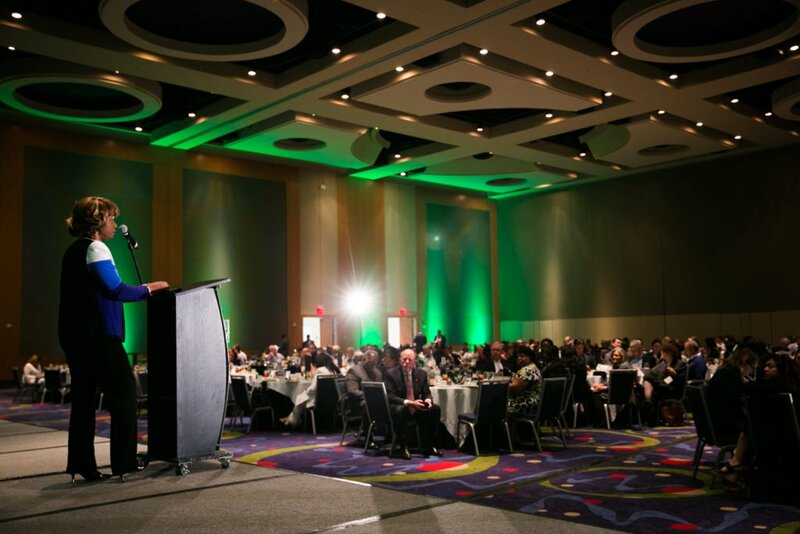 “It is extraordinary that we will speak of these monumental projects in the same breath as we talk about making sure that minorities and women-owned businesses have a seat at the table,” said Atlanta Mayor Keisha Lance Bottoms, who was joined by a host of Airport leaders April 3 at the Georgia International Convention Center. Bottoms credited the City’s growth and energy, propelled by the world’s busiest airport, as the driving force for attracting a number of businesses and making the top 20 list for Amazon’s second headquarters. The daylong event encouraged networking and information gathering during sessions covering safety and security, ethics, risk management, contract compliance, the procurement process and, of course, ATLNext. Hundreds attended, with more than 50 participating companies. “Your presence reflects not only your interest in the world’s busiest and most efficient airport, but also its future growth and development,” Airport Senior Deputy General Manager Michael Smith said. Keynote speaker, professor and author Dennis Kimbro shared insight from several prominent figures he interviewed over the years, including iconic Mayor Maynard Jackson. “Conviction is a force multiplier,” Kimbro said, referencing Jackson’s relentless pursuit of city improvements. Jackson was the father of Atlanta’s diversity and inclusion programs. And the City’s commitment to those programs continues today. Under ATLNext, the Airport hopes to achieve 37 percent participation among minority and women businesses. “We are really the model for the rest of the country and the rest of the world for what it means to include our minority and women-owned businesses,” Bottoms said.